Surprise someone special with a spectacular display of one of our most dramatic chocolate covered snacks. 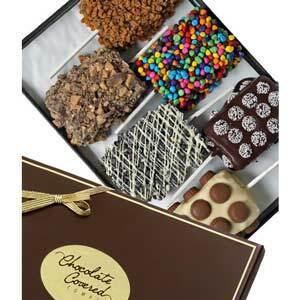 Crispy Treats are drenched in rich Milk Chocolate, Decadent Dark Chocolate and Heavenly White Belgian Chocolates. These delicious gourmet masterpieces are decorated with a fancy variety of sprinkles and candies by our artisans. Since these are hand decorated by our Artisans, no two will be exactly the same. Arrives in an elegant gift box.